The America SCORES Spring Season curriculum, Writing for the Community, uses literature and creative writing to encourage kids to learn more about their local communities and to feel empowered to positively impact those around them. Each team learns about service learning through the creation and completion of a community project. At the season’s end, each teams hares what they have learned and what project they completed with their school community and their families in an event called SHOUT. 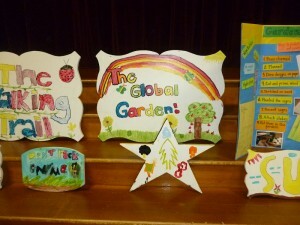 Parklane kids made their school more beautiful while also protecting plants and flowers in their garden! Oliver: These students completed a research project about family heritage to help promote knowledge of their school’s diversity. Each student researched their family heritage and then created a presentation (accompanied by a poster board) to teach other students and promote cultural understanding. Parklane: Parklane created a great school beautification project. 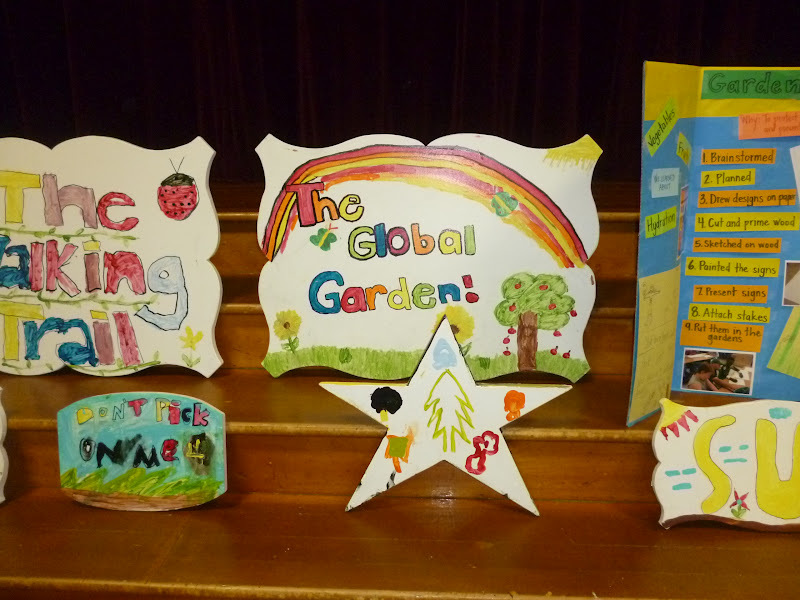 The kids painted wooden signs to both make the school garden more beautiful and to remind people not to walk on the plants and not to pick the flowers. They then presented their project in front of the other students and families at the SUN Showcase. Barnes: These kids completed an anti bullying campaign to improve their school community. They presented their posters and gave a performance at the SHINE Fiesta. Whitman: The students helped to plan and implement certain components of Whitman’s Cinco de Mayo celebration. The kids volunteered at the event by making signs, helping to run games, and helping to clean up. A poster with lots of photos of the America SCORES kids working hard and participating at the event can be found on display at Whitman Elementary! 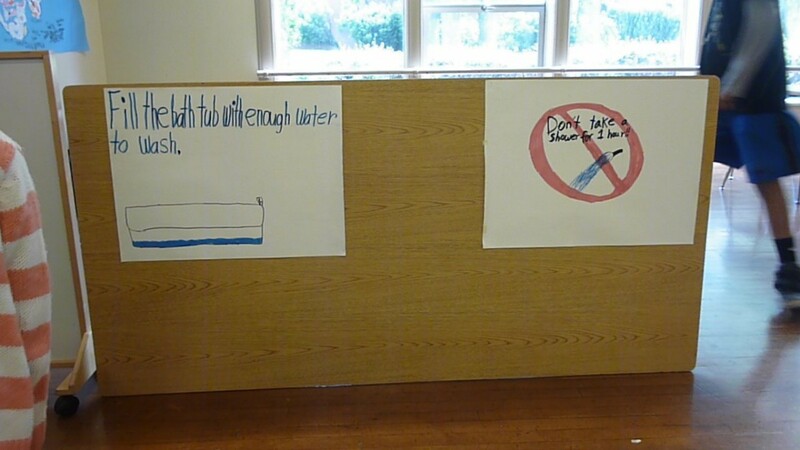 Markham: The Markham America SCORES team researched water conservation and created a wonderful awareness campaign. They created posters to hang up around the school and performed an educational presentation in front of students and parents. The performance contained skits to demonstrate “good” and “bad” behavior, poems about the importance of water conservation, and a quiz to test what the audience learned! Davis: The America SCORES kids helped with Davis’ Soccer de Mayo family day. 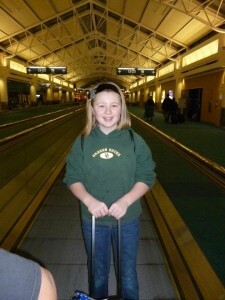 More information can be found in Active Children Portland’s most recent blog entry! 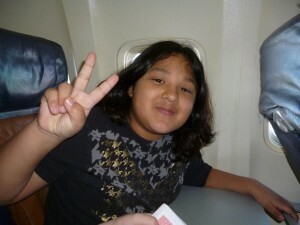 James John: The kids at James John learned about homelessness and hunger in Portland and created a canned food drive. The cans that they collected have been given to the Oregon Food Bank. The kids created a poster to display at the SUN Showcase which both presents their project and teaches other students and their families about hunger and homelessness in Portland. Markham kids educate their classmates about water conservation! Going to the White House! America SCORES Invited to White House for ‘Let’s Move’ Soccer Clinic with First Lady Michelle Obama! 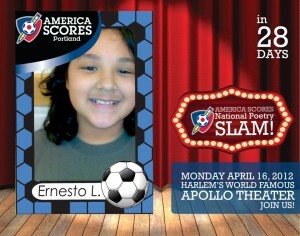 On May 15, 2012, thirty-four America SCORES students will get the opportunity of a lifetime. From America SCORES programs in DC, St. Louis and Denver, they will travel to The White House to participate in the Let’s Move Soccer Clinic with First Lady Michelle Obama and the Major League Soccer (MLS) Champion LA Galaxy. President Obama will welcome Major League Soccer champions, the LA Galaxy to the White House to honor their 2011 season and their MLS Cup victory. Following the ceremony, LA Galaxy players will join the First Lady to hold a Let’s Move! soccer clinic on the South Lawn for students from across the country. The children will also have the chance to watch the ceremony. “These six students [from America SCORES St. Louis] demonstrated good sportsmanship, thoughtful leadership, and perseverance this school year and are excellent representatives for our organization. The invite to the White House is beyond what we have dreamed for these kids and is an amazing opportunity that they will remember the rest of their lives,” said Serena Muhammad, Founding Executive Director, America SCORES St. Louis. 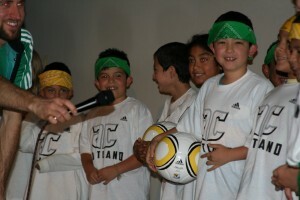 Through a unique combination of soccer, poetry, and service-learning, America SCORES inspires urban youth to lead healthy lives, be engaged students, and have the confidence and character to make a difference in the world. “We are honored that The White House recognizes the importance of what we do to address childhood obesity. Our hope is that we will continue to see even more support locally,” added Muhammad. America SCORES participants receive ten times more exercise than the national average and lower their BMI by 2% by the end of each season. Using soccer as a tool to encourage fitness, sportsmanship, and leadership, America SCORES inspires the life-long appreciation of sports and health-enhancing behaviors like choosing to eat more fruit and vegetables, participating in organized sports and spending less time watching television and playing video games. Each year, America SCORES serves 7,500 students at 150 schools through fourteen affiliates located in major urban centers across the United States. Founded in 1994 in Washington DC, America SCORES grew to a national organization and expanded to Denver in 1999, and again to St. Louis in 2005. Today, DC SCORES serves over 800 low-income DC youth at 27 schools; America SCORES Denver serves 320 youth at ten West Denver DPS schools; America SCORES St. Louis serves 260 youth at seven schools. http://acportland.org/wp-content/uploads/2015/10/Active-children-logo.png 0 0 acportland http://acportland.org/wp-content/uploads/2015/10/Active-children-logo.png acportland2012-05-14 20:28:432012-08-03 21:54:35Going to the White House! Check out the video footage from the National Poetry SLAM of the Active Children Portland kids in Action! Last weekend, two poet-athletes from Markham Elementary School in Portland performed at the America SCORES National Poetry SLAM! at the Apollo Theatre in NYC. We are so proud to offer these students the opportunity to have their creativity celebrated on a national stage. Woo hoo! 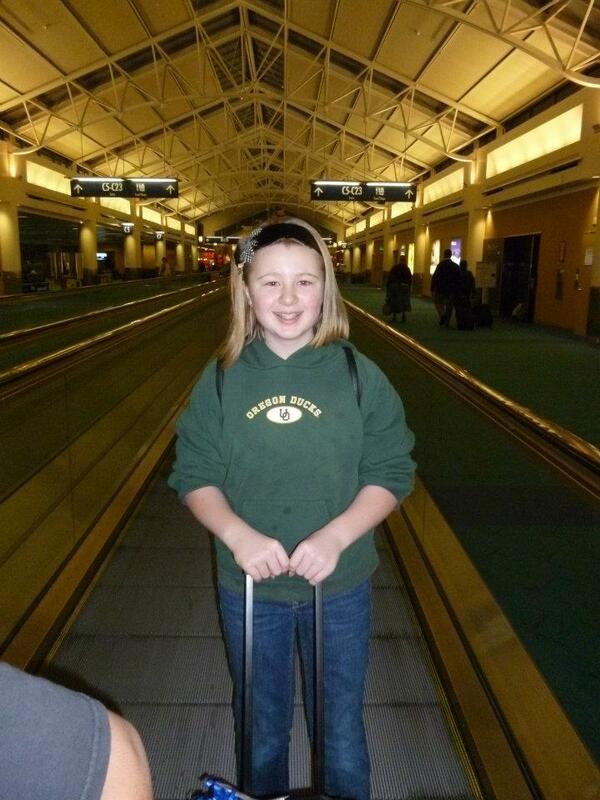 Dallas gets ready to board the plane to New York City! 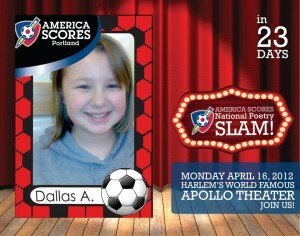 Dallas Anderson is a 5th grader known as “the epitome of team spirit!” She is very hard-working, loves to play soccer and sing and likes to incorporate jokes into her poems. 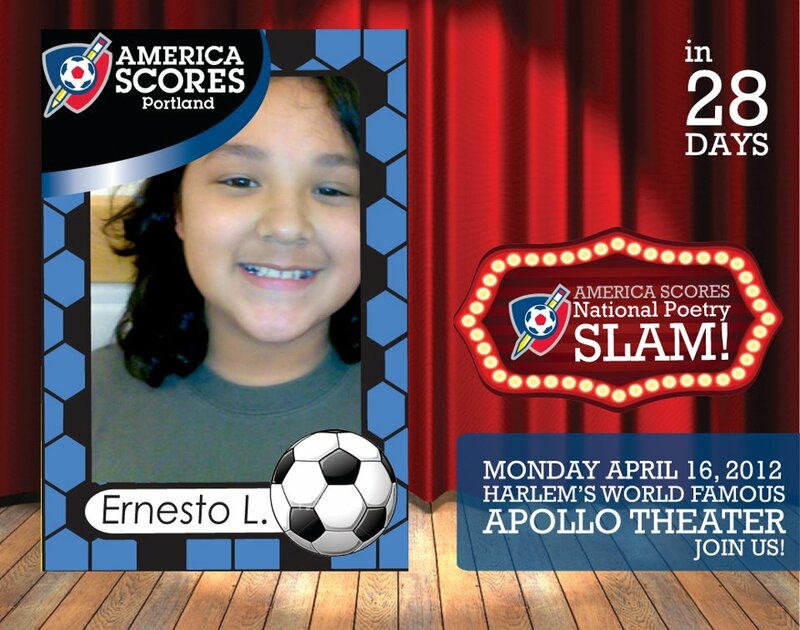 Both students participated in America SCORES this fall, a national program that combines soccer and literacy into an after school curriculum for 3rd-5th graders.We are so excited as this is Portland’s first year participating in the National Poetry SLAM! Dallas and Andres joined 28 other students from 14 America SCORES cities across the country and had the time of their lives. This year’s host was National Soccer Hall of Fame member, John Harkes and the Guest of Honor was New York Red Bulls President of Operations, Chris Heck. Dallas and Andres also met famous soccer players from the New York Red Bulls, shared the stage with smart-rapper – Psalm One, enjoyed a day at Central Park and gained the confidence and pride to perform in front of a packed house at the Apollo. All the creatures come out to bite. And he’s blue, but not that mean. But I’ll remember my raise! Most of the time when you hear the words, ‘Spring Training’ they are reserved for baseball, but not this time! Active Children Portland held its first ever ‘Spring Training’ last Friday at the adidas Village. We trained 25 coaches, helping to prepare them for our spring programming! We will have 400 students at 8 elementary schools participating in America SCORES and US Soccer Foundation’s Soccer for Success Program. 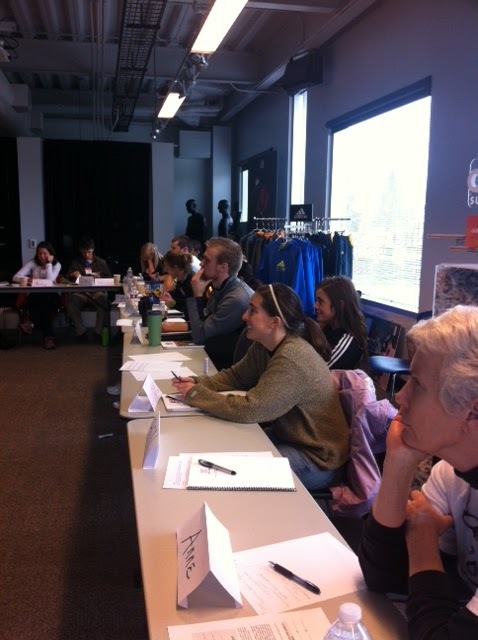 Coaches take notes during the behavior management and program training sessions. The training event was a huge success! 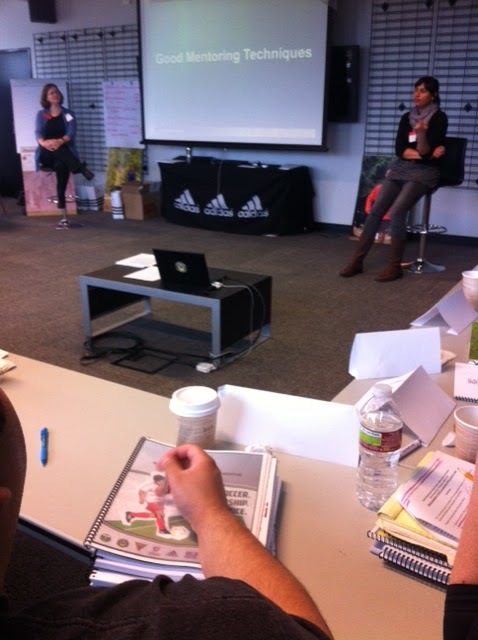 The morning got off to a great start with Christa Thoeresz, from the Portland Timbers, as our keynote speaker. Christa shared several stories about how sport can make a difference. Maureen Quinn and Stacey Sowders from OSU Extension Services helped lead the morning sessions, which covered mentoring and behavior management. The afternoon session had Zola Short from the US Soccer Foundation work with the Soccer for Success coaches, while Active Children Portland staff went over the America SCORES curriculum and led a soccer workshop on the adidas field! 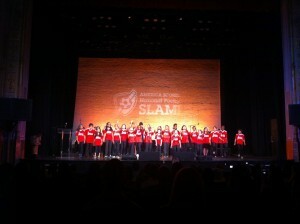 Active Children Portland is sending two students to the America SCORES National Poetry SLAM in less than a month! The students who won the trip participated in the fall season of America SCORES at Markham Elementary School, one of the Active Children Portland sites. Over the next few weeks we will be sharing more of their stories online, so be sure to check back to see updates about their preparation for the trip and to hear details about the event! Neither student has ever traveled to NYC before and are both very excited! Active Children Portland has been busy this fall season! We began both America SCORES and Soccer for Success programming at seven local elementary schools and just Soccer for Success programming at another two. 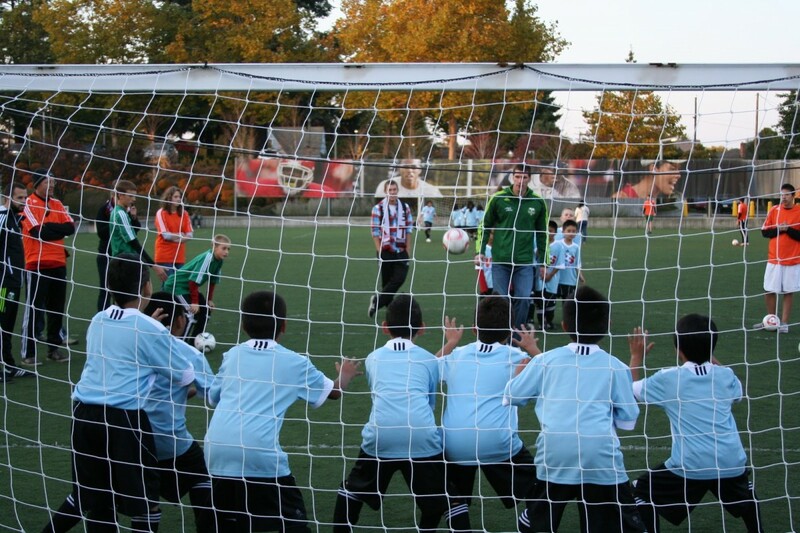 The America SCORES season was kicked off with a Fall Frenzy event that brought kids together from all over the city to participate in a two day friendly tournament. Highlights included a guest appearance by Portland Timbers player Kenny Cooper who can be seen below taking shots on kids in goal! November was a great month for Active Children Portland! On November 15th the dedication ceremony for the new micro field at James John Elementary was held. formally Active Children Portland collaborated with numerous organizations including Depave, Timbers Army, 107ist, Luis Palau, Season of Service, Southlake Church, Convergence Architecture and others to make this project happen and we are excited to see the field’s completion! Many people were on hand to share in the celebration including Timbers owner, Merrett Paulson and Adidas America President, Patrick Nilsson. 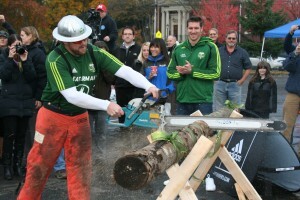 Timber Joey also made an appearance and sawed through a log to signify the beginning of play. 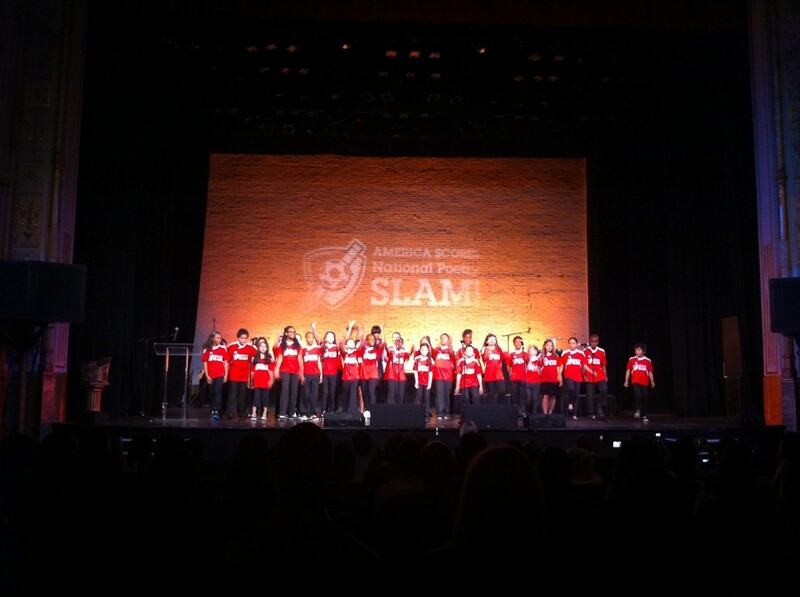 We finished off the month of November big, with the 1st annual America SCORES Poetry Slam held on November 17th! Program participants spent their fall season learning about and creating their own poetry in addition to their time spent out on the field and this event gave them a chance to show what they’d accomplished! Seven schools showed up at Benson Polytechnic High School to perform and compete in a friendly battle for a variety of different awards. Guest MC Renee Mitchell was joined onstage by several local guest poets including one poet who wrote a special piece about the America SCORES kids as they were performing on stage!